When seeking a high-risk small business loan, you must have realistic expectations and expect to pay a higher interest rate. A lender will want to minimize their risks by charging greater interest, or perhaps ensuring a short-term agreement. Small business finance has changed and it's near impossible to obtain bank financing these days. It's near impossible to obtain a bank loan with many years in business, a plain vanilla industry, perfect credit and positive cash flow ratios; let alone a business owner with poor credit or in a high risk industry. Fact is, non-traditional or alternative lenders have taken precedence in the small business loan space. Whether you have cash flow issues, history of liens, judgments, or even a bankruptcy... you can still get up to $1 Million to grow your business in as little as 24 hours. Short term small business loans, bad credit small business loans and high risk business loans from LVRG have helped thousands of businesses just like yours not only turn the corner, but pull ahead in the race. Bad credit or not, we’re here to help your business grow! Call (855) 998-5874 or click below to get started. 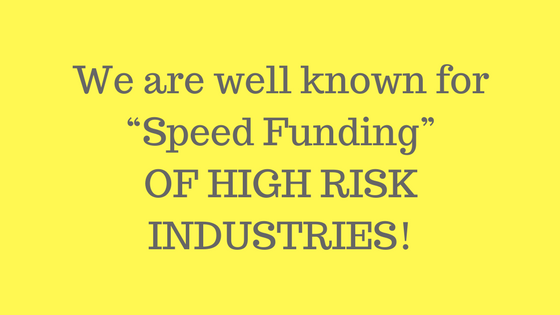 High Risk Merchant Cash Advances (MCA's) are offered to high risk merchants by LVRG Funding, one of the fastest growing small business funding companies in the country. There are only a few lenders and small business loan resources that are willing to fund high risk merchants, and LVRG leads the way. High Risk MCA's are available to businesses that have been classified as high risk merchants, and are therefore unable to obtain bank loans or any other form of financing from traditional lending institutions. A Merchant Cash Advance can provide high risk small business borrowers with an upfront fixed amount of cash of up to $1,000,000 in as little as 24 hours. The funding amount is based upon a percentage of the businesses credit card receivables or daily cash balances using historical credit card receipts and bank statements to determine the initial advance. The business pays back the advance, plus a percentage, often referred to as a discount factor, from a portion of their credit card receivables or cash available plus a percentage. The remittances are drawn from the business customer on a daily or weekly basis until the obligation has been met. One of the greatest benefits of a High Risk Merchant Cash Advance is that the funds can be used for a host of business expenses. If You Meet The Following Underwriting Guidelines, You Can Pre-Qualify For Up To $1,000,000 to BOOST Your Business!